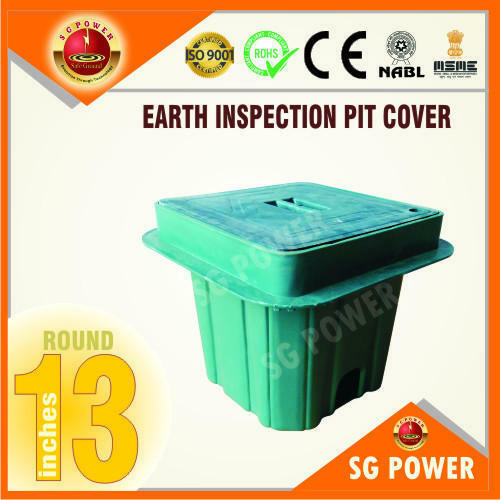 We are offering a wide range of Earth Inspection Pit cover to our clients. We, SG Power incorporated in the year 2007, as a single proprietorship, we are headquartered in Ghaziabad. We have grown since then into an industry leading manufacturer of a wide array of Copper Earthing Rod, Earthing Electrodes, Earth Pit Cover, Earth Pit Chambers and much more. Our diverse range of precision engineered products is designed for various applications in electrical, mechanical, commercial, rail and utility industries. The products we provide our customers are guaranteed to have immense functional attributes and are tested before dispersal. We adhere to all prescribed standards and parameters in the manufacturing and supply processes of these products. All manufactured and traded products are of outstanding quality and are highly appreciated by our large score of customers. All our products are manufactured under the supervision of highly qualified and trained professionals who have extensive industry experience and expertise. These professionals are selected from the best talents in the industry after careful scrutinizing of their skills and industry knowledge. The company also ensures to keep these professionals up-to-date with the latest prevalent technology and equipment. For this, we organize regular workshops, training sessions and seminars. Equipped with the latest modern equipment and innovative technology our infrastructure is contemporary and state-of-the-art. The professionals are provided with the latest equipment and technology to help enhance their work efficiency and design and cater to the needs of the customers efficiently. To ensure the smooth functioning of the company it is segregated into several well-equipped departments. Each of these departments is headed by efficient and qualified professionals. These professionals not only monitor the functioning but also allocate responsibilities to the others. Our well-managed system allows us to manufacture large amounts of products and cater to a large section of the customer needs and requirements. We also sustain large capacity warehouses for the storage of the procured & manufactured products.